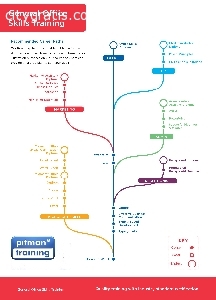 Here at Pitman Training Waterford we have a wide range of Office Skills Training Courses available. All our training courses are practical with no theory, just the skills that employers demand. Our Training Courses have proven results because 87% of our students have secured jobs within the same year they graduated! Walk in to any business or organization and you’ll find a common set of practices being used, incorporating the latest Microsoft Office software. If you want to get your first job, update your skills or switch careers for an office-based role, this diploma is perfect. It sends a clear signal to employers that you’re competent and confident in the skills they need the most. Administrative Assistant roles are many and varied - every successful business and organisation needs good, organised administration staff to take care of day-to-day tasks and support your colleagues in their roles. Designed specifically to help you secure a job as an Administrative Assistant, this diploma will teach you all the practical skills you need to succeed. You’ll learn to master the most popular Microsoft Office programs, how to create office documentation, gain excellent computer software skills and speak the language of business. Receptionists are the face of a company; they are often the first person clients or customers come into contact with, whether face-to-face, on the telephone or via email. So to ensure you operate effectively and give the right impression, you’ll need the professional and practical skills to thrive in this challenging and demanding role. Our Receptionist Diploma will teach you everything you need to manage a range of tasks and deal with enquiries and requests even when you’re busy. You’ll learn superior keyboard skills, how to produce business documentation and great IT skills - using the most popular Microsoft Office software. Plus, you’ll also have the option to choose one elective subject in the areas of keyboard speed development, good telephone techniques and audio transcription. Our HR Administrator Diploma will give you an edge over other people as it contains content specific to working in an HR team. It will therefore give you a great foundation to take your career in the direction of your choice – be it in a broad HR role or moving into the specialist areas of employment law, payroll or training and development. The world of Marketing is highly competitive and the number of applicants looking to break into this fast moving industry is always high.If you want to stand out and get the job, you’ll have to prove you’ve got the practical skills and knowledge required. Our Marketing Assistant Diploma is designed to give you a broad understanding of marketing principles, along with superior IT skills to take on these popular roles. This Diploma has been developed to give you the skills to work in a specialist marketing or PR agency, in a company’s marketing department or take on marketing responsibilities in your current role.